Looking at the new data coming in for our Wednesday/Thursday weather system. So far just NOAA's 0z NAM computer model is in. Lets take a look at the atmosphere in a 3-dimensional slice. I've gone in to the graphic and drawn on a few areas of interest. Mainly the area in the atmosphere where temperatures will be above and below freezing. Note the warm air that moves in over the cold air at the surface. The warm air will bring moisture up from the south/southwest and run the precipitation over the colder air. 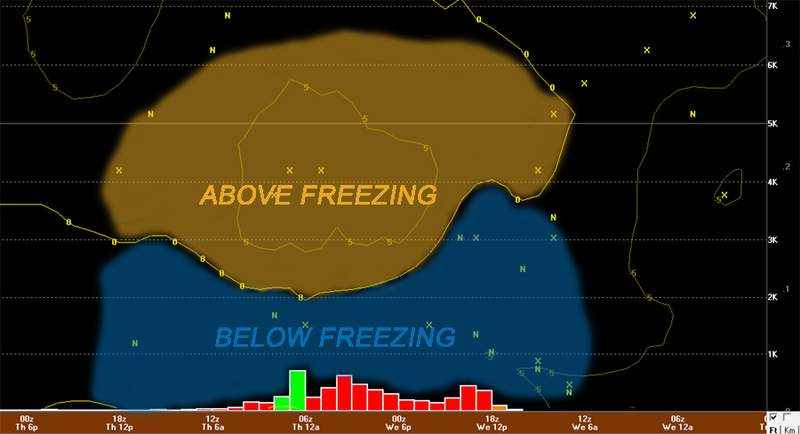 With the depth of the warm/cold air it appears that we are talking about mainly a freezing rain event. 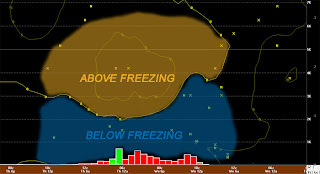 This run of the model is also indicating mainly freezing rain (indicated with the red vertical bars). It also tries to change the freezing rain over to rain for a couple hours Thursday morning. Now don't get too excited or panicked. This is NOT going to be anything like two years ago. The amount of water we are going to be dealing with is probably 10 times less. The NAM is indicating around 0.2" to 0.25" of freezing rain. So far I have seen models zeroing in on the 0.1" to 0.25" range. The big question for me is timing. The NAM (shown above) and the GFS bring the moisture in around 12:00pm CT Wednesday. The European model has consistently been bringing the moisture in late Wednesday night (after 9pm). I am still siding with the European model on the timing which lingers the freezing precipitation through Thursday morning. We'll have to see how the models handle the storm as we get closer to Wednesday. None the less... Right now it appears to me that the Thursday morning drive to work or school could be messy and will create some inconveniences. Wednesday's drive home from work or school is still in question due to the onset timing. One thing I want you to keep in mind with all of the discussion with this storm... At this point the "storm" hasn't yet developed over land. This is just a wave that the models are picking up on and extracting. Once the area of low pressure moves over land in the next 24 hours, the models will be able to bring in soundings that have been able to sample the atmosphere. In other words, there is a chance that a lot could change in the next 24-36 hours. This is great stuff. I always enjoy reading your analysis of upcoming weather events. Thanks so much for taking the time to do this. It's enjoyable for us "wannabe" weather nerds.